BEVRIJD DOOR HET CANADESE 'CALGARY' REGIMENT MET SHERMAN TANKS. DEZE EENHEID MAAKTE TOEN DEEL UIT VAN DE BRITSE 'POLAR BEAR' DIVISIE'. 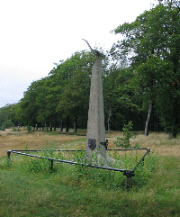 Ede - Ginkelse heide The monuments stands on the edge of the Ginkelse heide which was the drop zone for the Kings own Scottish Borderers. 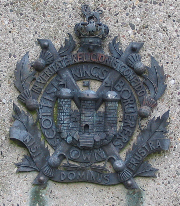 The monument was unveiled by General-Major Urquhart on 19 september 1960. Each year British paratroopers land on this place to commemorate the Allied landing during operation Market Garden. Oosterbeek - Civilian casualties The monument stands on the civilian cemetery at Oosterbeek, right across from the Airborne cemetery. 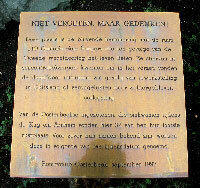 It commemorates the 120 civilians of Oosterbeek that were killed during the war.